You can view if a visitor is subscribed to your MailChimp lists and to which list. If subscribed, you can see the statuses of the emails sent (Example: Opened, bounced, etc.,). 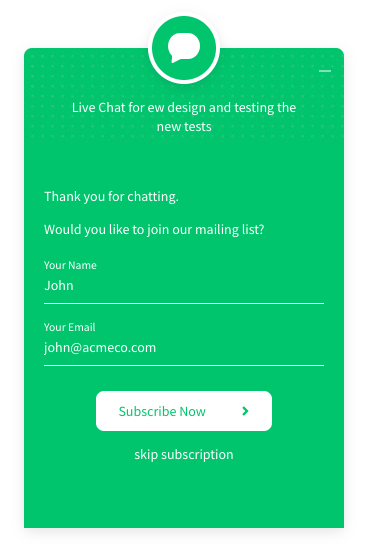 If not subscribed, after the chat ends visitor will have the option to subscribe to your mailing list. 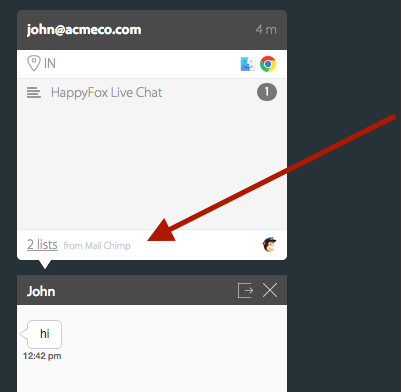 Only Admin has the access to integrate MailChimp with HappyFox Chat. This integrations is available in Mighty and above plans. 1. Login to your MailChimp account. 2. Click the profile name drop-down menu on the top right side → select Account. 3. Click Extras → select API Keys → Copy the API Key. Note: If API key is not readily available, click Create A Key → set Label → Copy API key → click Save. 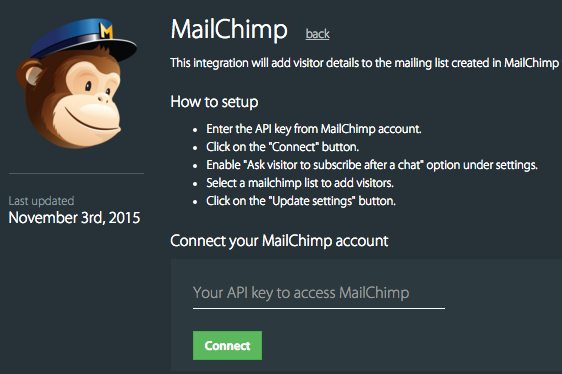 Step 2: Go to Apps → Email Marketing → MailChimp. Step 3: Click on INSTALL/TRY FOR 7 DAYS button. Step 5: Update your preferences under settings → Click Update Settings button. Congratulations! You have successfully completed the integration. 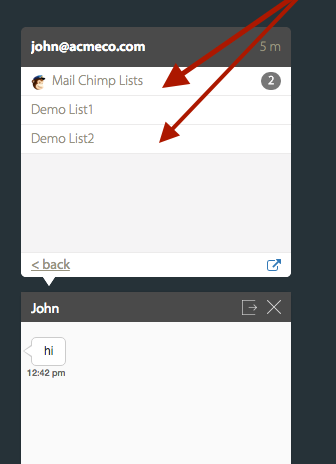 Agents can view if the visitor is subscribed to any of the MailChimp lists, during an ongoing chat. If a visitor is subscribed, agents can see which lists they are subscribed to. On clicking the list’s name you can see the statuses of the emails that has been sent to the visitor. 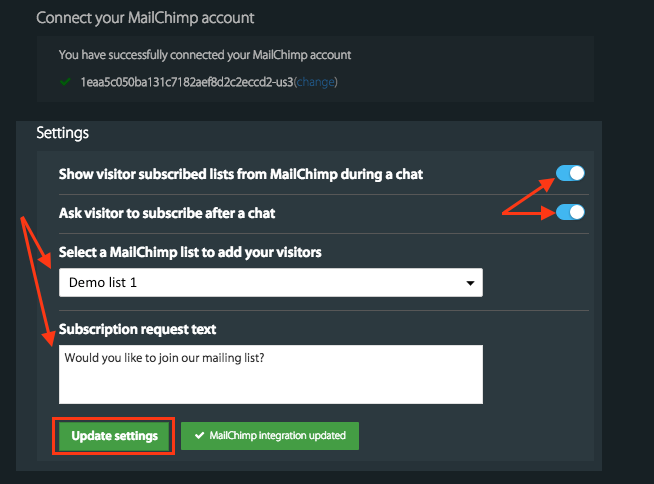 If a visitor is not subscribed, after the chat ends there will be an option for the visitor to subscribe to your MailChimp list. The visitor can prefer to either click on 'Subscribe Now' or 'Skip Subscription'. 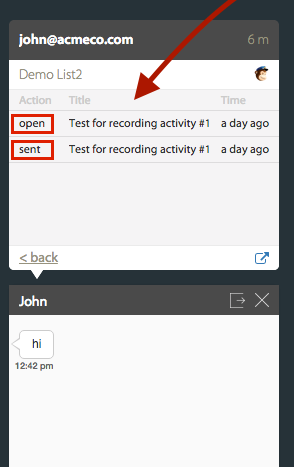 Engage your customers using HappyFox Chat and get more customers to subscribe to your MailChimp email marketing lists.